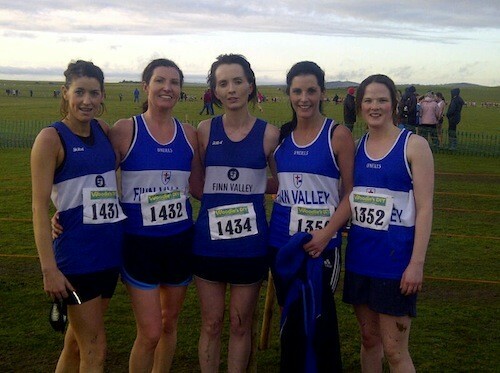 The wide open historic Curragh of Kildare was the excellent venue for the final National challenge of 2011 uneven age and novice . It began at 11.30 and by noon Finn Valley were on a roll. The diminutive Castlederg girl Aoife Mc Grath pushing into a top position with Buncrana’s Emer O Neill , Daniella Jansen a pupil at Dromore N S. and a fast finishing Lauren Mc Daid closing in only Naas AC getting in ahead by a few points . Also on duty Zoe Kelly of Dromore and Sinead Gallagher St Mary’s . On to the boys 11 age division Keith Mc Colgan hits the front ready to give it a serious shot didn’t exactly hang on but didn’t throw in the towel either battling with eventual team leader Shane Mc Monagle who hails also from Tooban N .S, newcomer Jack Gillespie ,Gleneely N. S. , and completing the team Alex Mc Geehin of Stranorlar . They were joined by Dylan Crossan , Pauric Harold and Adam Mc Crudden and again hey were just beaten by Munster champions West Waterford with a Co Clare squad in bronze. Shortly after noon the under 13 groups were out and about. There was a disappointing return from the girls but the boys were ready to have a go led by national under 12 champion Aaron Mc Glynn Glenfin. They were always in contention as was Convoy St Bridget’s lad Bryan mMcNamee ultimately 5th and 8th with Luke Gavigan St Mary’s , Stranorlar and just back from injury Denver Kelly with Charles Mc Daid ,Calvin o Brien , jamie Keegan and Samuel Mc Clintock in support silver medals for these lads behind Craughwell ,Galway. 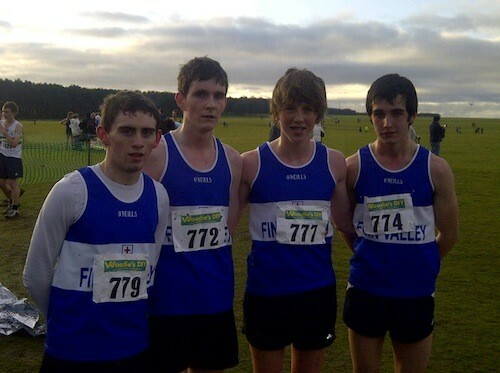 No luck for Valley under 15 but they came close under 19 boys but the absence of Patrick Hynes Foy who sick was telling. Mark Bonner, Ryan Porter, Justin Brown and Patrick Gallagher were on duty but just missed out . The Lifford 5k Sunday had a cross section of athletes Fit4life etc won by recent recruit crossroads native Gerard Gallagher and the women’s section winner student Ailish Patton a double for the Valley contingent. Very encouraging to see so many parents travel to the Kildare venue and next up Boxing Day / stephens Day 5k @ Finn Valley 2pm and there is an open invitation to all young and old to come out and make it a great family occasion. Finally a big well done to Fionnuala Britton European cross country champion only the second Irish ever the previous winner Catriona Mc Kiernan.